If you’re a first-timer in the smoky world of grilling, you may consider not to invest in an expensive, high-end griller/smoker especially if you don’t have the experience of using it yet, even if you have the funds. Get something that is reliable yet won’t break your heart if you run into problems in the future because of your trial and errors. A great start would be buying something like the Brinkmann Charcoal Grill and Smoker, as it is cheap and does the job like a pro. You won’t find anything as reliable and as affordable as this one. PROS: The Brinkmann has a no-nonsense way of usage. The design is simple; it’s easy to use and easy to clean. The results always have these qualities: excellent flavor, tender, juicy, and appealing. People would wonder why they have purchased smokers that go over $500 when there’s one below $100 that does the job well. This smoker is also made of lightweight materials that is easy to assemble and store in your garage or be transported anywhere you please. CONS: It’s a big hassle to add more charcoal if you’re going for long cooks/grills because there are lots of smoke and heat loss whenever you would open the door that leads to the charcoal pan. It would be great if Brinkmann could design something where the charcoal chamber is completely separated from the main body. Also, there are a few instances when some customers received a leaky smoker. This can be resolved by putting gasket tapes though. What are the important aspects of the Brinkmann 852-7080-E Charcoal Gourmet Grill and Smoker? Type: The Brinkmann Grill and Smoker runs using charcoal or wood chips as fuel. This is the cheapest method to use compared to electric and gas smokers. The upside is not only the cost; this smoker is also capable of putting an additional delicate smoky flavor and scent to your food. This is something that many BBQ aficionados consider important. Therefore many would rather sacrifice the ease of having to use an electric or gas smoker. These types of smokers wouldn’t require your attention as it can grill and smoke on its own. All you have to do is place the meat and turn the knob on. Unlike charcoal smokers where you have to continuously check on the smoker to ensure that the temperature is maintained. Charcoal smokers are also quite messy to use. You need to clean the fuel and water pan after every use. You also have to wait a while for the charcoal and wood chips to burn a decent temperature before putting the meat in, which can be quite hassling. However, the end result is always worth it. 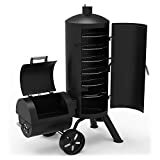 Portability: Although this smoker isn’t that heavy compared to other ones in the market (this weighs 33.3 pounds), moving it might be a bit of a challenge because of its shape and the lack of wheels. Good thing it comes with two wooden handles at each side that stays cool for easier lifting. Even though the handles won’t burn your hands, don’t attempt lifting it while in use, or while still hot, because it might cause injuries. This smoker measures 17 by 17 by 35 inches and comes with a 1-year limited warranty. Capacity: The Brinkmann Smoker comes with two chrome-plated steel cooking grills can hold up to 50 pounds of food. For example, you can cook a big ham on one level and a whole chicken on the other. The top and bottom grills cook in the same temperature so before putting meat in, consider what cooks the fastest and put it on the top grill so you can take it out easily afterwards. Insulation: Although it fairly cooks well and is considered by many as well insulated, few owners complained about their Brinkmann leaking heat and smoke. This is easy to remedy, especially if you’re only going to fill in a few gaps. Just use gasket tapes that are easily installed and can be bought in many major hardware shops. Accessories: The smoker has a dome lid that holds a thermometer responsible for flashing the temperature at a glance. It also has a front-hinged door that allows for replenishment of charcoal or water while in the middle of smoking. However, the door is too small and you can only add so much at a time if you don’t want too much smoke and heat to leak out. Other highlights of this smoker are the porcelain-coated steel water pan, an extra-large aluminized-steel charcoal pan, free wood chips, and a separate base pan for easy cleaning and set-up. What other things should you know about the Brinkmann 852-7080-E Charcoal Gourmet Grill and Smoker? The Brinkmann Smoker is fairly easy to assemble; you need to dedicate about an hour and use the accompanying manual. Owners lament about how it should come with a gasket to place over leaky edges. However, anyone can buy this easily and won’t cost too much. The process of having a finished grilled rib would take at least half a day so it’s important to determine how much you’ll cook and when it’s going to be served. For the price, the Brinkmann Charcoal Gourmet Smoker wins hands down. For the quality of materials (although a bit leaky), the capacity, and the overall finish, it’s a pretty good deal, especially if you’re just starting out in smoking. If you just want to try first how smoking goes using charcoal as fuel, don’t invest in anything about $100, get this Brinkmann smoker and you’ll definitely get your money’s worth.